Very interesting technique. Is it combination of beading and macrame? So marvellous...but nexletters didn't founded....Sorry ! Waowww!! très joli mouvement et très jolie couleur! I like it! thats a very different & interesting bracelet!! Liked the use of designer's creativity. Gr8 job ..keep up the good work. I am found of fashionable jewelry and this bracelet suits my requirements. 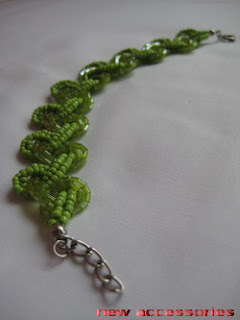 Liked stylish jewelry from omericaorganic.com if possible have a look. I love it! It's my first time here. I love your work and I enjoyed going through your blog. 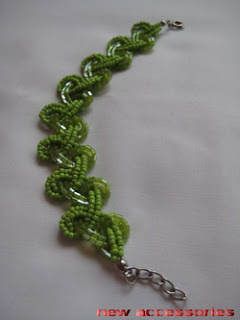 I want to learn more about beaded jewelry and I find lots of useful information here. Keep posting your photos! Beautiful design! I am also partial to the lime green color! Good work! 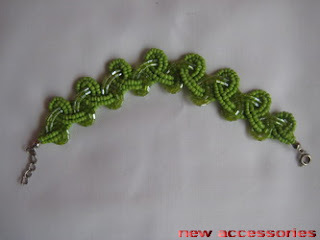 I love nature color and this one is a symbol for appreciating the loveliness of color green. This necklace is very simple yet very elegant.